Unique Coach Training - Intuition, Energy & Heart! - Artist of the Spirit - Unique, Intuitive Life Coach Training & Certification Program! BE TRANSFORMATIONAL IN YOUR LIFE AND WORK. Earn three certifications in one training program! There are so many skills and tools that make all the difference in feeling successful when helping others. At Artist of the Spirit, we get it. ​Our next session starts May 7th! ​Life & Coach Training Program. At Artist of the Spirit we start with you, leading you into yourself to explore your unique truth and gifts as you learn to trust your intuition and wisdom. We train you for life, ​and we certify you for coaching so you become skilled at supporting real transformation and healing in the world. Our three certifications give you three times the power so you triple the effect you have as a Life, Energetic and Spiritual Coach – all from our 3-month training - setting you apart from the crowd! While other people (or programs or psychics) may try to tell you what’s meaningful or important to you…the truth is, no one else can tell you what your ideal path or choice should be. They can support you, but you're the only person in the world that can (or should) make that decision. Love intimate classes? So do we. Enrollment is limited so apply today. 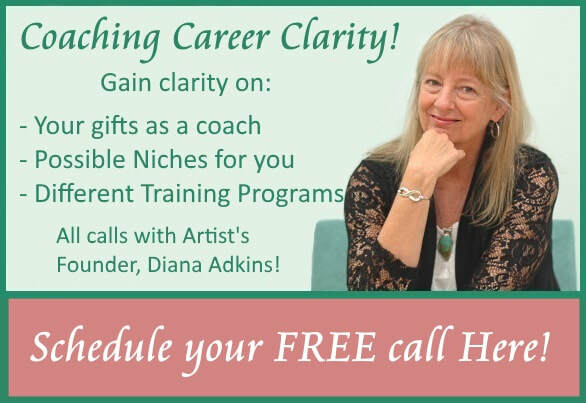 Each month, founder and trainer Diana Adkins hosts an informal call so you can ask questions about the joys and benefits of being a life coach. Ask about our program or anything else you'd like! CALL DETAILS AND MORE RECORDINGS HERE!